Rhubarb in a sweet sauce, topped with a butter enriched oaty crumble. 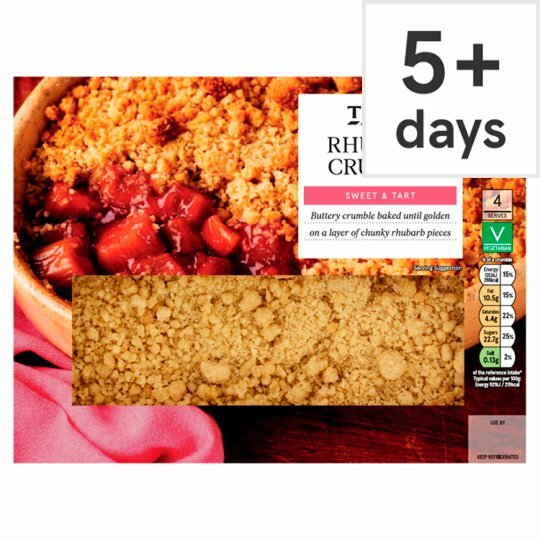 INGREDIENTS: Rhubarb (42%), Wheat Flour (Wheat Flour, Calcium Carbonate, Iron, Niacin, Thiamin), Sugar, Water, Butter (Milk) (4%), Cornflour, Oats, Palm Oil, Dark Brown Soft Sugar, Rapeseed Oil, Raspberry Concentrate, Honey, Salt, Yeast, Pasteurised Egg White, Emulsifiers (Mono- and Di-Glycerides of Fatty Acids, Mono- and Di-Acetyl Tartaric Acid Esters of Mono- and Di-Glycerides of Fatty Acids), Soya Flour, Preservative (Calcium Propionate), Flour Treatment Agent (Ascorbic Acid). Instructions: From chilled: 190°C/Fan 170°C/Gas 5 25-30mins Place on a baking tray in the centre of a pre-heated oven for 25-30 minutes.